We love oranges at our house any way you slice them. I made a peelable banana...which I still need to share with you...and that got me thinking it would be fun to attempt a pealable orange with sections. I haven't seen a peelable orange like this (although I'm guessing there may be some out there), so this was a bit of an experiment for me. I also really liked the orange slices on Thinking Mama, so that's the vision I had going into this. Doing it this way, the orange slices come out of the peel...with a peel. I wanted them to work both with the peel and on their own, though. 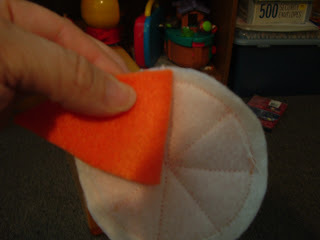 You'll need: orange and white felt, the pattern for the wedge part I'll include at the bottom of this post, a tuna can and regular sized can (for tracing or I traced them and included them in the pattern), and all the typical sewing stuff. I used a combination of hand sewing and machine sewing for this one, but you could easily do it all hand sewing if you wanted. 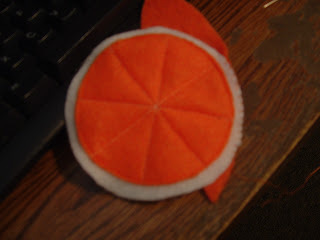 I started by cutting out white tuna can shaped circles and orange circles the size of a regular can. 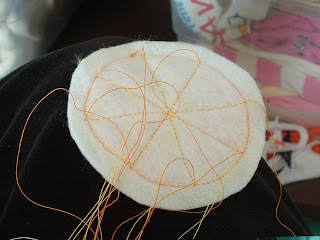 Then I sewed the orange circles to the white circles, so it looked like this. 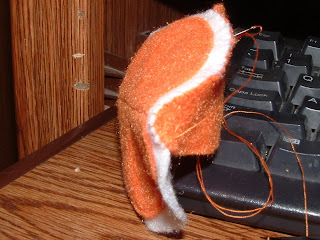 I used my trick of leaving the tails long, pulling them all through to the back, and tying them in a knot. And then tidied it up by tying the knots. Next, take your orange wedge and find the middle. I did this by folding it in half. Match that up with one of your section lines. (It won't matter which ones if you they divide your orange evenly. 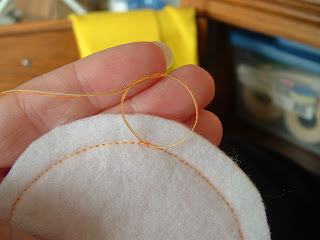 Starting from this middle point, I sewed the wedge and circle together by hand using a whip stitch (at least I think that's what it's called. When you get close to the point of your wedge, you'll want to see how things are working out. 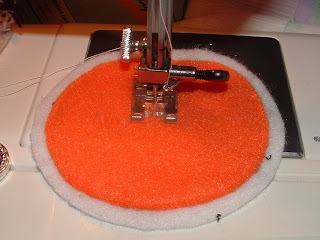 You want the top to be pointing directly at one of your stitching lines. 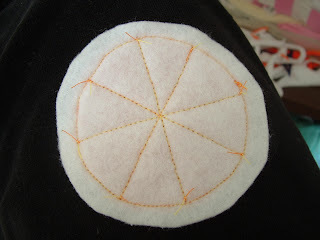 The placement will vary a little depending on exactly how big you cut your circles and exactly how you cut your wedge. 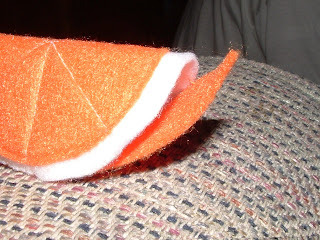 In my experience, the orange wedge that I made for my pattern is just a tiny big long. You can see there that it's extending a bit beyond where I need it to. The easiest thing is to trim it and round it just a bit to make it fit. Just make sure you trim some off each side of the wedge like I'm beginning to do here. 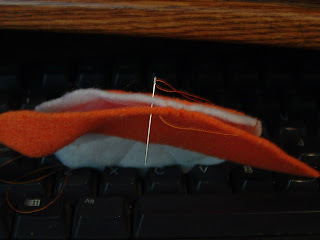 Then keep sewing it up. 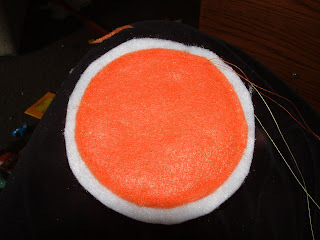 Once I'd sewed around the whole orange, and just had a small opening left, I stuffed the wedge full of chopped up felt pieces (It's stuffed pretty tight), and then sewed up the hole. 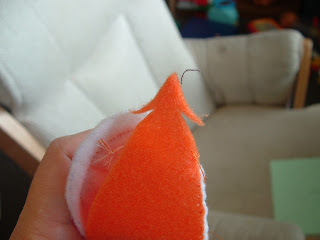 Unless you want to make 5 of these orange sections and then make an orange peel, so your little one can peel their orange and eat it up. Yum! Come back soon for instructions for the orange peel. If you like the look of the strawberries check out my post here. 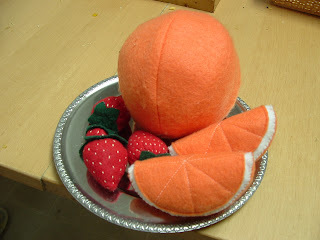 I've included the strawberry top pattern (not that you really need one) with the orange pattern below. 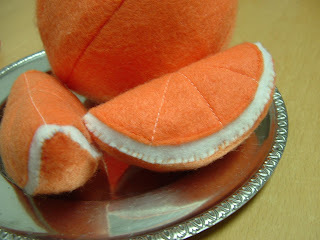 You can download the printable pattern for the orange slices here. 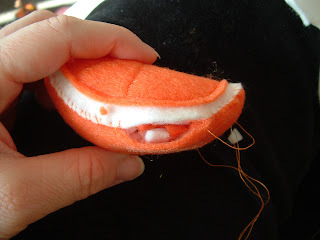 If you're just now joining us, the links to other felt food tutorials I've done are at the top of the right side bar. 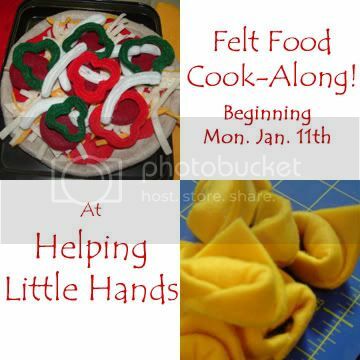 Also, if you've made some felt food of your own, be sure to share your link here, and grab a button to let other people join in on the fun! Amazing...I'm really curious to see how the peel works. Email me if you want some felt. I found a bunch in my "stash" today along with John Deere flannel and some Warm and Natural batting. I'd love to mail it to you. That looks so cool! You did a great job on those oranges!! I made some apple slices based on your pattern and tutorial. 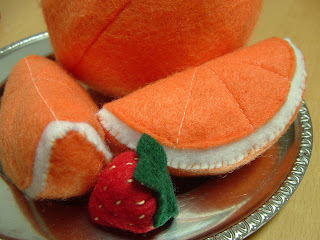 I'm so addicted to this felt food stuff!! Thanks for this fantastic tutorial! 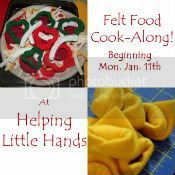 I'd love for you to link this up at my Felt Food Roundup on OneCreativeMommy.com. I hope to see you there!